Lifetime warranty, 365 days trail period, that’s about enough to grab anyone’s attention and grab our attention they have. Nectar a relatively new Bed in a Box company have pulled out the big guns, and they are surely intimidating. These offers along with the specs of the Nectar mattress has fostered a media hype that has spread the Nectar Mantra far and wide to every corner of the US. 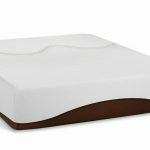 It was only natural that we also were hyped to review the Nectar mattress and see if it does live up to the huge expectations it has now garnered for itself. The first layer is comprised of gel memory foam(2) that is 1 inch thick and sewn into the cover(1). The cover is tailored from a blend of Tencel and Cotton, the presence of cotton allows for a truly soft and highly breathable cover. It is designed to foster better air flow, relieve pressure points while offering a truly plush and premium feel to the sleeper. The gel infused memory foam, on the other hand, is constructed to absorb heat from the surface of the bed and conversely the sleeper. After the first quilted layer, the next layer is support layer that is 1 inch thick and made of proprietary Lush foam semi-open fast recovery gel memory foam(3). This layer supports the first layer and also aids in cooling the bed. The third layer is made of a 3 inch Hi Core memory foam(4) that functions as both a load bearer and contour provider. This layer has a relative density of 3.5 PCF is crafted to efficiently wrap around the body of the sleeper and also provide rebound and pressure relief. The fourth layer is the base layer. It is composed of s 6 inch thick support foam that acts as the foundation and pillar for the bed. It is designed to improve the build factor of the mattress while providing deep compression support. All these layers accrue up to form a foam with a diameter of 11 inches. On a scale of 1 to 10 where 1 is the softest and 10 is the hardest, the Nectar mattress sits comfortably at 6. This firmness level is reminiscent of a universal mattress designed for the majority of sleepers. The Hi Core Memory Foam which is quite dense does a good job of conforming round the sleeper and providing the needed hug and support. 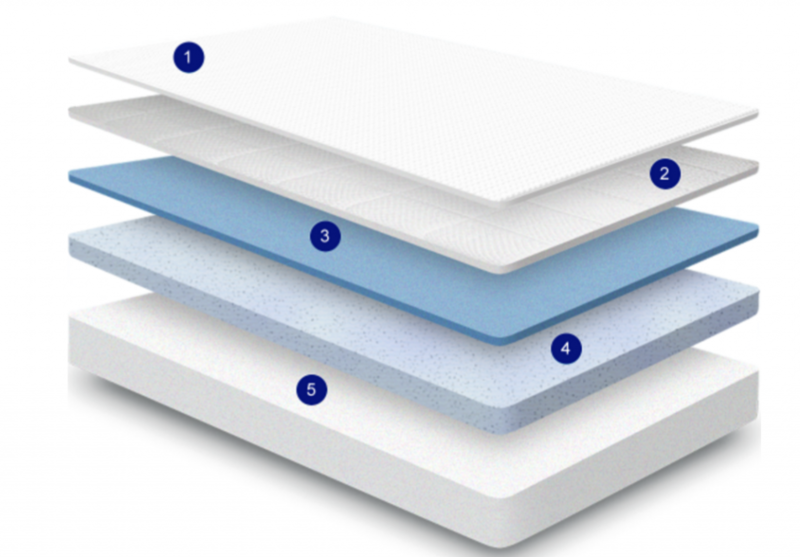 Like other memory foams in the market, the Nectar mattress cushions all impact and pressure points with relative ease. Also, we didn’t notice any transmission of vibration and movements in our motion transfer tests; a feature we were quite happy with as this ensures that individuals who plan on sharing the bed with a partner do so without concern. However we did notice that the bounce and responsiveness on this foam were somewhat abysmal, it took quite some time for the mattress to push back on registered impact or pressure, this is particularly worrying as it exposes the likelihood that the mattress may be subject to over sinking and unnecessary ‘hugage’. That said, support was still marvellous and well distributed, even at the edges. Because of the actively breathable first layer, and the Gel infused memory foam, it was no surprise that the mattress did pretty well in the cooling department. However, we noticed that there was a significant bit of warming up during the day, this is to be expected as the memory foam incorporated into this mattress is rather dense; but like I said the breathable cover and gel infused memory foam go a long way in curbing any unnecessary heat build-up. For memory foams, one of the recurring bane is the issue of off-gassing. We did notice a significant level of Off-gassing in the Nectar mattress that lasted for close to three days, while this is easily countered by sufficiently airing the mattress before use, it is a matter of concern to individuals with allergies and a heightened level of sensitivity. The Nectar mattress starts at $500 depending on the size of the mattress. In comparison with other brands of memory foam, this is quite cheap. For the quality of materials invested in making this mattress, the price is a steal for consumers and demonstrates Nectars resolve to challenge all laid down industry traditions. 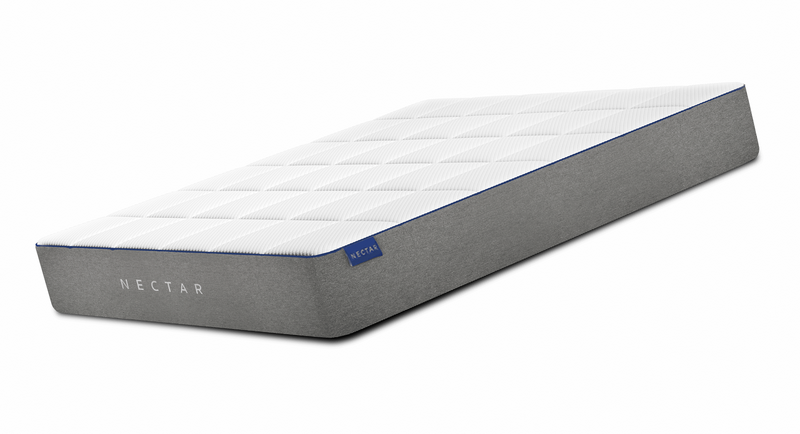 Competitor brands that offer a similar mattress as the Nectar mattress are sure to set you back by close to $950. Nectar like Nest also provides a financing option that enables intending buyers to stretch payment over a period. In their case, the financing plan is non-interest based and extends for just six months. Nectar runs an exclusively online retail outlet, a move that is probably cost oriented as this effectively cuts out the influence of middlemen (who are known to cause a hike in the price) in the price-value chain. This is one of the reasons they are able to sell their mattress at such low cost. The online route, however, deprives potential customers the opportunity of testing the mattress before buying. It is in this regard that Nectar has unveiled a 365 days trial period, during which a consumer can return the mattress, for a full refund if he/she feels it doesn’t meet their sleeping standards. Again an industry first it goes a long way to show the trust Nectar has in their product. For us mattress-guides.com, it is a very nice feature that is sure to quell any scepticism about the mattress performance. in two days and typically requires a week for it to get to the final consumer. It comes vacuum sealed and compressed in a box. This is where it gets interesting Nectar are offering a lifetime warranty, what that means is that throughout the course of the owner’s life if there are any shortcomings in the mattress, resultant of poor build quality or artisan errors Nectar will replace or repair the mattress free of charge for the said owner. For the first five years, the above statement is valid, however, after that period, a replacement will cost the owner about $100 which covers the shipping fee, if a defect in the mattress is confirmed this shipping fee is waived. This lifetime warranty coverage is an industry first, and it goes a long way to emphazise the durability and confidence Nectar has in their product. At this point Nectar ranks C in our business reputation charts, consequent of the fact that they are relatively new in the mattress industry. However, given the well-crafted mattress and impressive features they have delivered, we predict that they have come to stay and even probably dominate their competitors in their category niche. The Nectar mattress features a cover equipped with a zip line that facilitates its removal from the bed itself. Nectar, however, advises against machine wash and recommend traditional spot cleaning to remove stains and death. In the case where irreparable damage has been done to the Mattress, the owner can request for a brand new one from Nectar at no extra cost. For us, that is just marvellous. Given the thickness and density of the support/ foundational and other corresponding layers, the durability of this mattress is top-notch. This is further reinforced by Nectars lifetime warranty. For the quality and overall sales value, the Nectar mattress delivers it should start at twice its price, as competitor brands offer mattresses of lower build quality with lesser features at an even higher price. The Nectar mattress is a quality bargain that is guaranteed to provide the intending consumer with value that is more than what he/she paid for. One idea that has been sold to us by the mattress industry is that we need to change our mattresses after a given time to guarantee a peaceful night rest. Nectar on the other hand as is characteristic of them have come to break this status quo. The Nectar mattress is extremely durable, thanks to its build materials and less susceptible to wear and tear. This fact in conjunction with their lifetime warranty delivers on Nectar promise of the buyer not needing any new mattress if they get a Nectar mattress. For its price, the Nectar mattress is one of the best bargains in the mattress cynosure. The lifetime warranty and 365 day trail period is are also very enticing. However, the mattress has a very low level of bounce and responsiveness as it takes an extended period for the mattress to regain its shape after an impact is registered. This might not be a deal breaker for most (for us it wasn’t), but it’s an area Nectar has to improve on seriously. That said the Nectar mattress is a fantastic mattress and given its price we highly recommended it to anyone looking for a mattress that delivers an actual memory foam experience but has a tight budget.